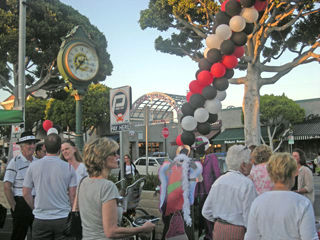 It’s one, two, three cheers for Hope Net’s 20th annual Taste of Larchmont Village, “Hit a Home Run for HopeNet,” to be held Mon., Aug. 20 from 6 to 9 p.m. on Larchmont Blvd.An international feast and live music will be at restaurants up and down Larchmont Blvd.between Beverly Blvd. and First St. Try Thai specialties at Chan Dara, tamales from El Cholo and Mediterranean cuisine at Le Petit Greek. Caribbean specialties will be served at Prado, and California French is on the menu at Le Pain Quotidien. Village Pizzeria, Z Pizza, Louise’s Trattoria and La Bottega Marino cook up Italian, while California Roll & Sushi and the new Hamburger Hamlet XP are also on the menu. Desserts include sweets from BabyCakes, Baciamai Café, Baskin Robbins, Café Gratitude, Canter’s Deli, Crumbs, Fancifull Foods and Miss Lilly’s Cookies. Sample drinks at Larchmont Village Wine & Spirits, Jamba Juice and Coffee Bean & Tea Leaf. RAFFLE TICKETS can be purchased in the city parking lot. Tickets for the Larchmont Chronicle-sponsored event are $40; Angels purchase two for $100. Raffle tickets are $5 each with grand prizes of a Las Vegas getaway and 12 dinners for two. The event benefits HopeNet’s 14 food pantries at area churches and temples. Last year, 150,000 households benefited from the volunteer-based group. For tickets call 213-389-9949, or visit www.hopenetla.org.